The time between the glory of the Roman Empire and about the year 1000 is often referred to as “The Dark Ages.” Historians can pick nits all they want about specific dates, but the fact remains there are about 500 or so years with big gaping holes in the historical record and we are just now learning about much of what took place then. There seems to be a boom in people filling in the gap with exciting adventure stories. One of those is the Chicago-based writer Cynthia Ripley Miller. I’m a history geek, ironically adventurous, and I have a weakness for the underdog (literally, I support Paralyzed American Veterans and Puppies Behind Bars, an organization that aims to rehabilitate prisoners by giving them puppies to train as service dogs for disabled veterans). As a child, I daydreamed a lot. A devoted teacher taught me to read and then there was no stopping me. I‘ve devoured works across most genres, including religion, philosophy, psychology and self-improvement. I’ve traveled, worked and lived in different countries, and my adventurous predisposition includes a sprint across the Parthenon with a security guard on my heels, a stay with a Jamaican family in the Negril tropical jungle, and backpacking across Europe to Istanbul. I live outside of Chicago in the US with my family, along with a sweet German Shepherd and a cute, but bossy, cat. What’s your “Long-Hair Saga,” series about? I’m currently writing a series called The Long-Hair Saga. A portion of my novel includes the Germanic people called the Franks. Their nobles were referred to as Long-Hairs and later they would begin the Merovingian Dynasty in France. There are two completed books. The first is called On the Edge of Sunrise. 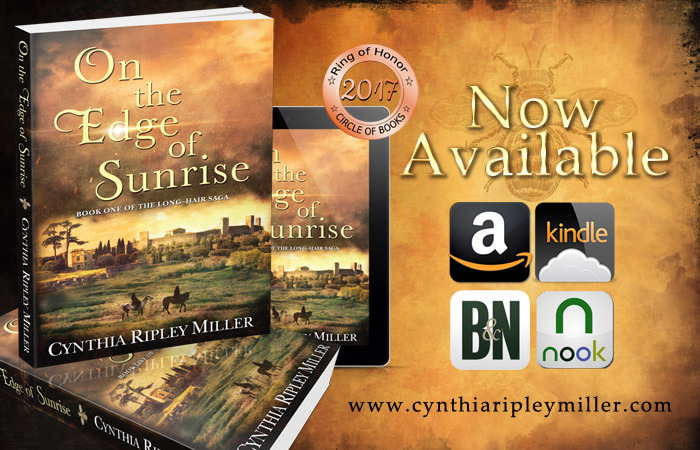 This novel takes place in late ancient Rome AD 450, about 26 years before the actual collapse of the empire in the west. My heroine is a young widow called Arria. She longs for a purpose and a challenge and is well versed in politics and diplomacy as any man. She’s called, by the Tuscan people, La Precipienda, ‘She who perceives.’ Arria has a reputation for having solved several local mysteries. When Emperor Valentinian, determined to gain allies to help stop the Huns, bearing down on the empire, sends Arria to the Assembly of Warriors in Gaul, she must try to persuade the Franks to stand with Rome against Attila. On her way, she is abducted by barbarian raiders, but is saved by the Frank blue-eyed warrior, Garic. Arria is alarmed by her instant and passionate attraction to Garic and is torn between duty and desire. Her arranged betrothal to the ambitious tribune, Drusus, her secret enlistment by Valentinian as a courier to Attila the Hun, and a mysterious riddle—threaten their love and propel them into adventure, intrigue, and Attila’s camp. Arria and Garic are rebels in a falling empire. They must find the strength to defy tradition and possess the love prophesied as their destiny. Three years after the Roman victory over Attila the Hun at Catalaunum, (AD 454) Arria Felix and Garic the Frank are married and enjoying life on Garic’s farm in northern Gaul (France). Their happy life is interrupted when a cryptic message arrives from Arria’s father, the esteemed Senator Felix, calling them to Rome. At Arria’s insistence, but against Garic’s better judgment, they leave at once. On their arrival at Villa Solis, they are confronted with a brutal murder and a dangerous mission. The fate of a profound and sacred object—Christ’s Crown of Thorns—rests in their hands. 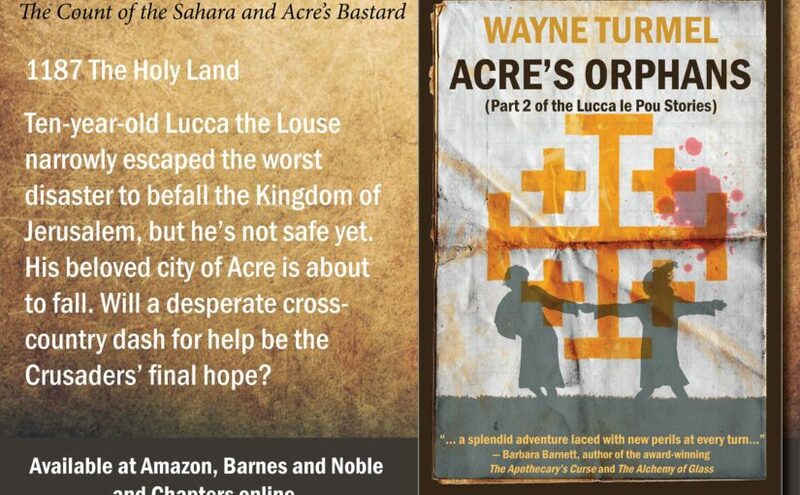 They must carry the holy relic to the safety of Constantinople, away from a corrupt emperor and old enemies determined to steal it for their own gain. But a greater force arises against them—a secret cult who will commit any atrocity to capture the Crown. All the while, the gruesome murder and the conspiracy behind it haunt Arria’s thoughts. 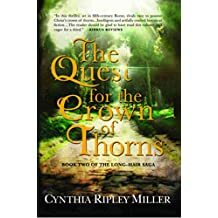 Arria and Garic’s marital bonds are tested but forged as they partner together to fulfill one of history’s most challenging missions, The Quest for the Crown of Thorns. I’m working on book 3, which will take Arria and Garic to ancient Jerusalem and another suspenseful adventure filled with mystery, murder and a most unusual mission. Why that time period? What intrigued you about it? My Italian roots (I’m a first generation Italian-American) and my time spent in Italy and teaching history propelled me toward ancient Rome. However, what really caught my interest was late ancient Rome, right before the fall of the western empire. This is a period when medieval influences are dawning in styles of dress, weapons, religion, and customs. It’s a twilight era, a time of upheaval, conflicts and a historical period ripe for story-telling. 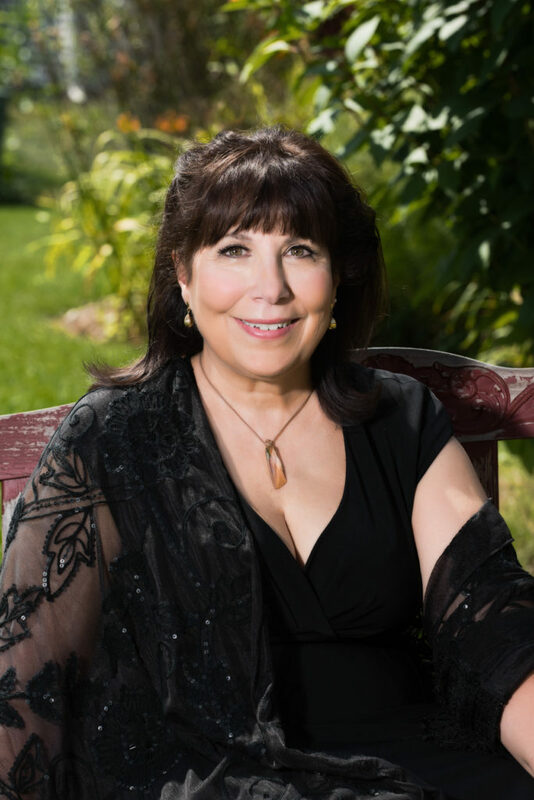 As a novelist, my roots lean toward historical romance/ mystery & suspense. I really enjoyed the novel Outlander. It spurred me to write an adventure romance that included several genres—Romance, history, political intrigue, suspense and mystery. I like the idea of strong characters and a heroine and hero supported by colorful characters that have smaller stories that help to create sub-plots. I love movies and books that bring me into secondary stories that enrich the overall arching theme and major plot. When a reader tells me they liked a particular supporting character, I feel good. I cannot write two main characters with one or two in the background. My muses won’t let me. The dang muses are like that. What’s your favorite scene so far? My favorite scene in the book is when my heroine, Arria, goes to the battlefield at Catalaunum (also known as Châlons and considered in the top10 bloodiest battles in history) looking for the hero, Garic—not sure if he’s alive or dead. This is the climax of the novel and when a major twist in the plot line happens and characters collide. Where can we learn more? My books are available on Amazon , Barnes and Noble, Kobo and more. Not to barge in on Cynthia’s interview, but Acre’s Orphans officially launched January 28th! You can order Paperbacks on Amazon, Barnes and Noble, and Chapters. The e-book is Kindle only Please help me launch it successfully by buying now. And any time you read a book like The Long-Hair Saga (or one of mine,) please leave an Amazon or Goodreads review. It’s like applause for the author. I read The Quest for the Crown of Thorns and really enjoyed it. Your support of other writers is an onspiration, lady.